Wednesday 29th April 2015Thievery or Idiocy? When you hear about a painting mysteriously disappearing, it's generally pretty safe to assume that the piece was stolen - especially when it's just been listed and sold by an auction house for over £2.2 million. Art theft is a major problem in the industry, and while it's not exactly a new wrinkle, there are those who are naturally extremely frustrated by the possibility of having their new and incredibly expensive purchase lifted out by a five-finger discount. In this case, however, the story is a bit more ridiculous than a dashing, debonair gentleman cat burglar (or even a dodgy group of backstabbing thieves). 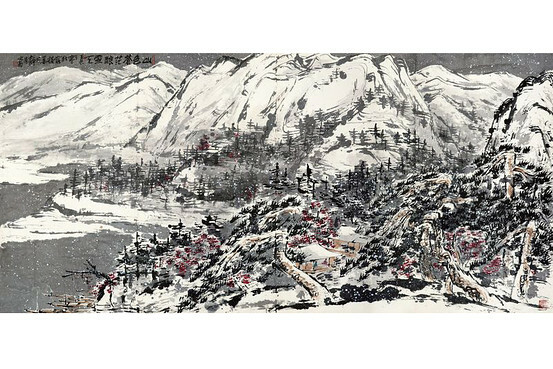 The painting in question is entitled Snowy Mountain (shown to the right), painted in 2012 by Chinese artist Cui Ruzhuo, who also happens to be one of (if not *the*) highest-fetching Chinese artists still living, and while it wasn't exactly stolen, as far as police can yet determine, it has definitely disappeared from the Grand Hyatt hotel where it was being sold on the block. The bizarre wrinkle became apparent when police took the standard precaution of reviewing the CCTV footage of the time in question. Quite clearly, it shows cleaning staff collecting the painting and absconding with it, which has lead police to consider the possibility that it has now taken up residence in one of the city's landfill sites. While the Grand Hyatt has neither confirmed nor denied the possibility that their cleaning staff are responsible for the theft / mix-up, it has stated that hotel staff aren't supposed to have anything to do with the auction items, as their value is quite extreme, and that private companies often provide their own security and custodial staff. Poly Culture, the company which hosted the auction, is also the third-largest auction house in the world behind Christie's and Sotheby's when ranked by revenue, and was hosting the auction in Hong Kong. Awkwardly, this is their very first sale following an initial public offering earlier this year, adding some additional major embarrassment to the mess. This does make it seem more likely that they were being targeted as being unprepared by some extremely prepared thieves, but there is no evidence yet that suggests this was the case. Only time will tell if the painting is ever recovered, but who knows what will happen to Poly Culture's stock price after a huge gaffe like this.